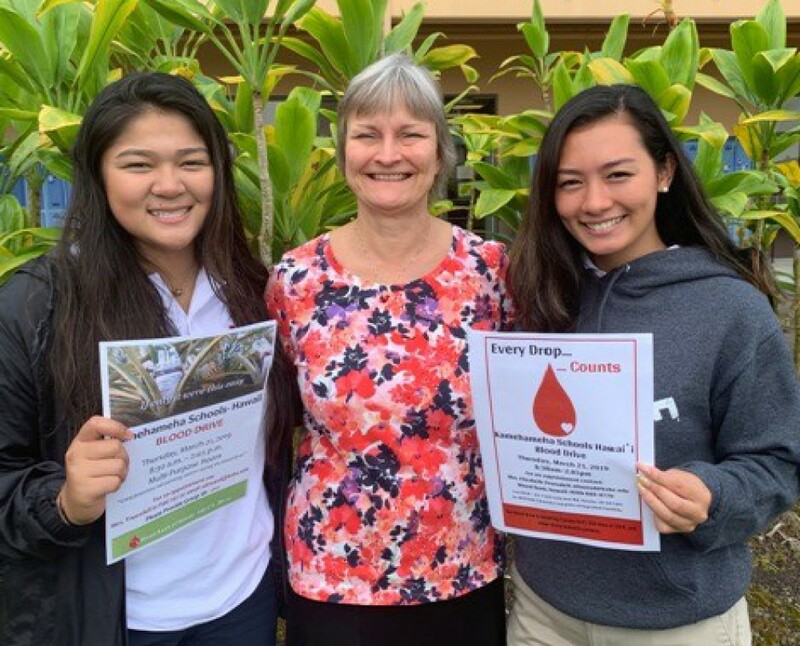 Since 2013, KS Hawai‘i student leaders with help from the school’s LifeSAVERs’ Club have hosted blood drives that collected over 1000 pints of blood – enough to help save over 3000 lives! Above are club advisor Elizabeth Truesdell (center) and blood drive student coordinators Landen Kukahiwa (left) and Ho‘onani McClung. A single pint of blood can help save three lives! For information on donor eligibility and to find the blood drive nearest you, visit the Blood Bank of Hawai‘i website. According to the Blood Bank of Hawai‘i, every two seconds blood is needed for a lifesaving treatment or emergency care. 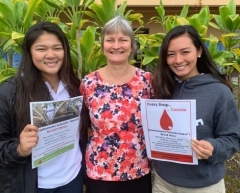 In recent years, Kamehameha Schools Hawai‘i haumāna have raised awareness of our state’s critical need for blood donations through Senior Legacy projects – a KSH graduation requirement which challenges students to sharpen their leadership skills by addressing community needs. The campus recently wrapped up its third community blood drive of the year, spearheaded by KSH High School Student Body President Ho‘onani McClung. With the theme of “Every Drop Counts,” the campaign collected 265 pints of blood. “The drives have been the Senior Legacy project of students consistently since 2013,” said KS Hawai‘i High School English Kumu Elizabeth Truesdell, advisor of the school’s LifeSAVERs’ Club. “Since then, we have hosted blood drives that collected over 1000 pints of blood – enough to help save over 3000 lives!